And just like that…. | Scuffalong: Genealogy. And just like that…. – Scuffalong: Genealogy. … the elusive Aunt Ella. Back before I completely fell off the 52 Ancestors Challenge, I wrote a piece about my great-great-grandmother Loudie Henderson‘s sister Louella. The gist of it was that, other than the 1880 census and my grandmother’s recollections, there were no sure sightings of this woman. But Ancestry’s new North Carolina Marriages collection is paying off for me in a big way, and the first cha-ching was Aunt Ella’s license for her marriage to William James Laws in 1931. 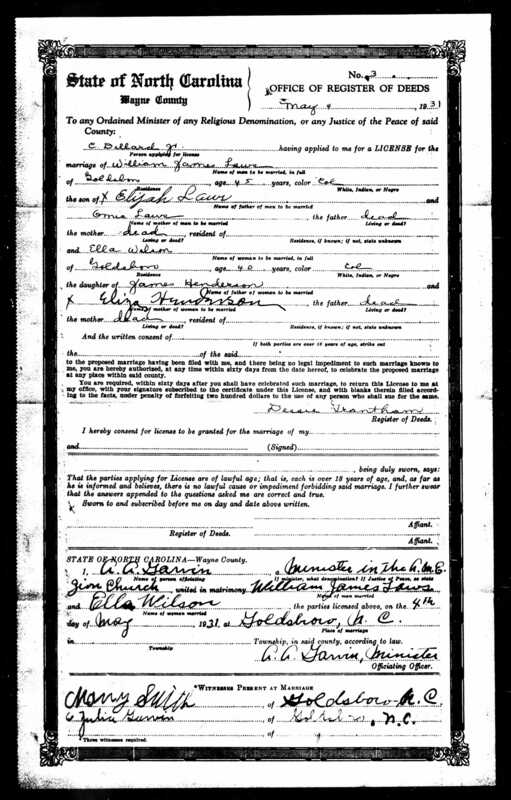 The collection is indexed by parents, as well as bride and groom, and a search for James Henderson picked the record up. I’m elated, but thrown. The last husband my grandmother remembered was Wilson, but he clearly was not the end of the line for Ella. (And 40? Please. By 1931, she was pushing 55.) The witnesses: is that “Mary” Smith? Or “Nany” Smith, i.e. Nancy “Nannie” Henderson Smith Diggs, Ella’s sister. Nancy’s second marriage, to Patrick Diggs, was short-lived, and in the 1930 census, she had reverted to Smith. And which A.M.E. Zion church? Rastus Best?!?! Aunt Ella was married yet another time? And where are the licenses for the husbands — King and Wilson — I thought I knew? And Disciple Church? So. Louella Henderson King Wilson Best Laws moves to the top of my “get to the bottom of this” list. A quick search for a Laws death certificate turned up nothing, but I’m hot on her trail. ← North Carolina Marriage Records. That’s a lot of last names to sort out! 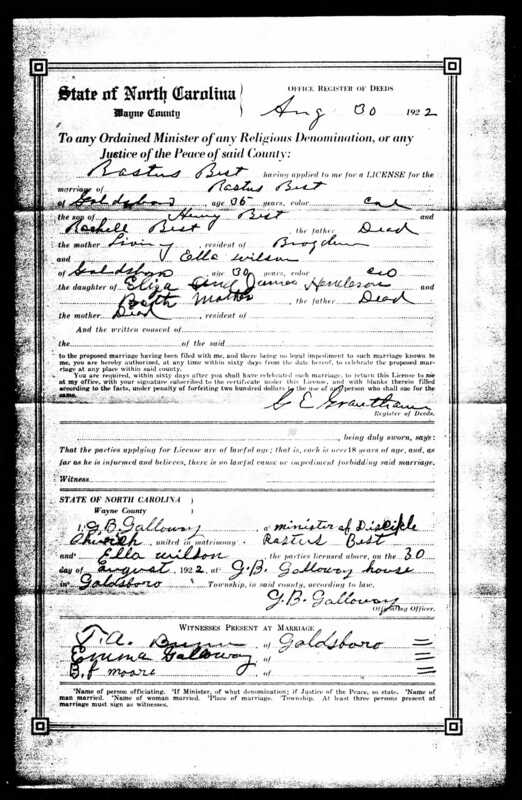 Pingback: North Carolina Marriage Records. | Scuffalong: Genealogy. Pingback: Two sisters. | Scuffalong: Genealogy.